Makin' it in Memphis: A day gone to the dogs. 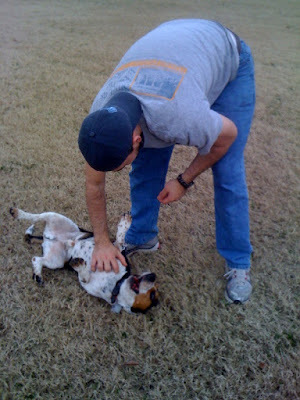 On Saturday, after a delicious lunch at Cafe Eclectic, we decided to take our doggies to the park. Well and by park, I really mean to the fenced in football field at Snowden Middle School (don't worry, we picked up their poo). 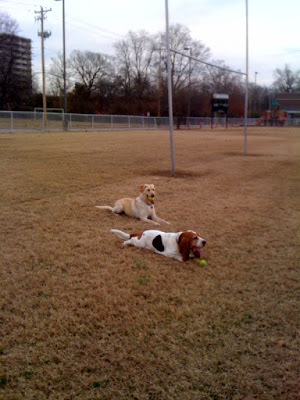 See, a fenced in football field is advantageous for our dogs since they like to follow scents and wander. Luna Addington and her owner Elise came along as well. Beamer, Sebastian, and Luna proceeded to run after balls, chase each other, bark, and find every mud hole possible. 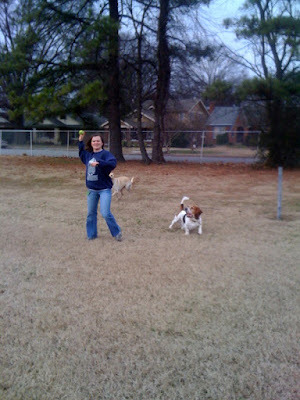 Elise threw the ball for them, which was very nice. At the end, the dogs were just worn out. It was a good day and a good time with friends.